Posts tagged with "finance lease"
If you are a small business owner, you know just how difficult it can be to try to receive financing from your local bank. In fact, there are many ways that indirect financing can be troublesome for small business owners, leading to costly monthly payments, and undue stress on your behalf. That’s why, at Lease Genie, we provide direct financing for your small business when banks won’t. From stringent lending requirements and excessive working capital requirements to interest rates that don’t work in your favor, there are a number of reasons why you should consider direct financing over indirect financing. In today’s article, we will be talking about what exactly direct financing is, while providing you with more information on how our direct financing program works! Are you a business owner that is having difficulty receiving the funding that you need to get your operations off the ground? If so, then you could benefit significantly by working with Lease Genie; the best small business financing company that is dedicated to your success! We know that no two company’s needs are the same, which is why we offer a number of different financing options for your convenience. From working capital loans and construction equipment leasing to commercial vehicle leasing and new equipment financing, Lease Genie is here to tell you “Yes!” when the banks tell you “No.” If you are thinking about applying for direct financing with Lease Genie, but would first like to learn more about our direct financing program, then consider reading more below! Traditional forms of indirect financing require that a financial intermediary, such as a bank, provide you with the financing you need to help your business grow. Essentially, a financial intermediary is “an entity that acts as the middleman between two parties in a financial transaction.” While this seems like a standard procedure, indirect financing does come with some pitfalls. For example, while receiving indirect financing, there is no guarantee that your financial intermediary will remain as a constant. In fact, often times, financial intermediaries can change hands, causing confusion on your behalf. With direct financing from Lease Genie, however, you can be confident knowing that your lender will remain constant throughout the entirety of your financing term. This is just one of the many ways that we are able to provide the most in value to business owners through direct financing! If you would rather take the route of direct financing, then you are probably wondering how our direct financing program works. For starters, no matter what kind of business you own, there is a good chance that we can help fund your business’s needs! With flexible payment plans and 100-percent financing with no down payments, we are confident that you will be able to receive your funding with ease! Our process requires little paperwork, and allows business owners to work directly with the decision-maker instead of having to work with a third party. Contrary to indirect financing, our direct financing program ensures that your application is never left to an automated machine. In fact, every direct financing application that Lease Genie receives is reviewed by an experienced credit analyst that is committed to helping you receive funding for your business, if possible. What really sets us apart from banks, however, is that we use a risk-adjusted loan pricing model, which can help us better assess the qualifications of all applicants, no matter their credit ratings. So, if you’re tired of being denied financing from banks in your area, then you need to talk to the friendly professionals at Lease Genie today! 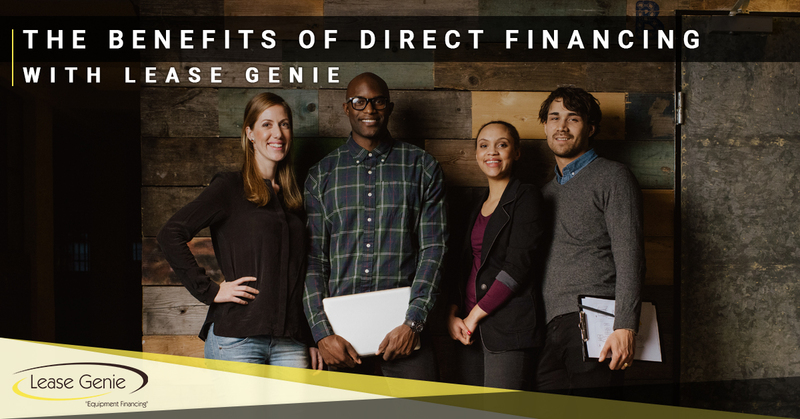 If you are interested in learning more about all that our direct financing program has to offer your business, then reach out to the friendly professionals at Lease Genie today. We are constantly working to help small businesses grow by providing them with the working capital that they need to succeed! While we offer a number of different financing options to choose from, we also have a number of resources on our website for your convenience. From our handy leasing calculator to our informative FAQ page, we continue to offer the most in convenience for all of our clients. Visit our website today to get started! This entry was posted in Business Financing Omaha and tagged bad credit leasing, equipment financing, finance lease on May 30, 2018 by David Craig. As a small business owner, you may find it rather challenging to receive funding for your business’ needs. Oftentimes, small business owners have a difficult time meeting the strenuous requirements set in place by banks to acquire the financing they need to streamline their day-to-day operations. This is cause for concern for many startup business owners, as eight out of 10 small businesses fail within the first 18 months of their inception. 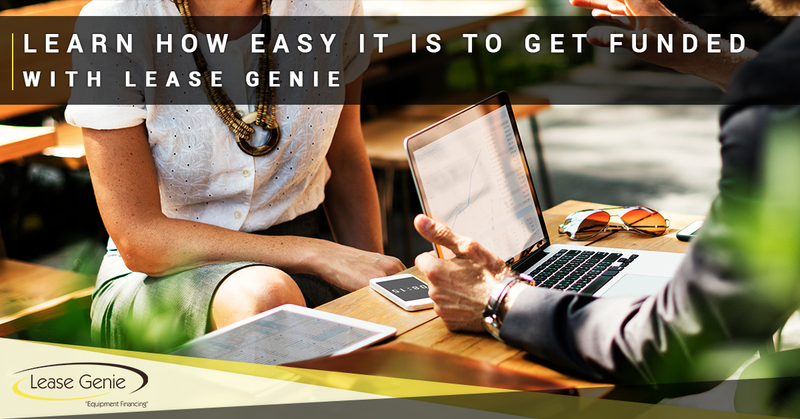 However, with Lease Genie, there is a better way to receive the financing you need for business equipment, expanding your operations, renovating, and so much more. 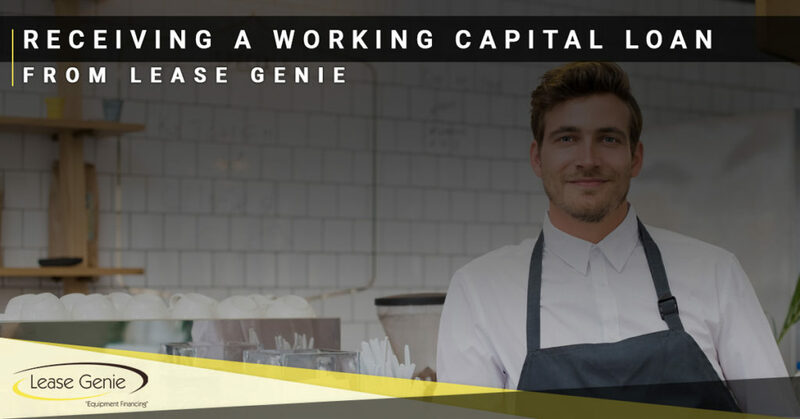 That’s why, in today’s article, we will be talking more about working capital, and how you can easily apply for your next small business loan with Lease Genie! If you have applied for a small business loan, only to be turned away by banks, then consider getting in touch with Lease Genie. We say “Yes!” when the banks say “No,” as part of our continued commitment to helping small businesses expand their operations. With more than 30 years of industry experience, we have the tools and expertise to ensure that you receive the funding you need to eliminate the hardships that so many small businesses initially face. With financing ranging from $5,000 to $5 million, we are confident that we can provide you with the necessary funding to help get your business up and running! If you are interested in learning more about receiving a working capital loan from Lease Genie, then continue reading more on the topic below! If you are new to the world of financing, then you may not know what working capital is or how it works. Simply put, working capital is the total amount of capital that a business has on hand for their day-to-day operations, which can be determined by taking a business’s total assets, less their total liabilities. As you can see, as a small business that is just beginning to start your operations, it can be difficult to have sufficient working capital that will allow you to become profitable early on. This is one of the reasons why Lease Genie provides working capital loans to small businesses, so that they can worry less about their funding and more about their business. While you may find it difficult to receive the funding you need for your business at your local bank, Lease Genie makes it easy. In fact, we offer the most in financing with loan requirements that are geared towards small businesses. To qualify for a working capital loan with Lease Genie, you must simply process credit card transactions for at least 60 days, while processing at least $5,000 in credit card sales each month. By following this financing model, we are able to help small businesses grow while offering fast and convenient funding! In fact, many businesses that apply for a working capital loan with Lease Genie are typically approved for financing in 24 hours or less! If you are wondering whether or not your business is eligible for receiving a working capital loan, you can rest assured knowing that we work across several different industries for your convenience. From restaurants and construction companies to hair salons and landscapers, there are few industries that we haven’t helped receive funding for their working capital needs. We know that you may face a number of roadblocks working with banks, which is why we work hard to make it as convenient as possible for business owners to hit the ground running! We hope that you found this article on working capital loans to be informative. If you have any questions or concerns about our services, or if you would simply like to learn more about how Lease Genie can help your small business grow, then don’t hesitate to reach out to our team of knowledgeable professionals today. We have helped countless businesses receive the working capital they need to flourish, and we’re ready to help you too! To get started today, simply visit our website, provide your name and email address, and click the “get funded now” button. It’s that easy! We look forward to helping your small business grow! This entry was posted in Business Financing Omaha and tagged bad credit leasing, equipment financing, finance lease on May 24, 2018 by David Craig. If you are a new business that is strapped for cash, there is a good chance that your lack of funding imposes certain limitations that can compromise your daily workflow. From unsuitable equipment to no equipment at all, there are many reasons why startup companies struggle to get their feet on the ground during their first few years of operation. However, with equipment financing, you can quickly and easily begin to operate how a professional business should. That’s why, in today’s article about getting approved for equipment financing, we will be discussing a few of the industries that Lease Genie commonly serves! If you are looking for the top equipment financing company that offers quick and easy approval times, look no further than Lease Genie. We know that it can be difficult to receive funding for your business, especially if you are unable to receive funding from banks, which is why Lease Genie says “yes,” even when banks say, “no.” If you are interested in learning how Lease Genie can help your business grow, continue reading more on the subject below. As a restaurateur, you may find it difficult to keep up with the many demands of your customers. To make matters worse, old or broken down kitchen equipment can leave your food service slow or completely inoperable at times. This can leave much to be desired for guests, who may be inclined to visit another restaurant the next time they decide to eat out. Why lose potential returning customers when you could be turning a profit as soon as you open your doors for business? With Lease Genie, you can receive equipment financing for kitchen appliances, dining furniture, and so much more. Using old construction equipment can be dangerous and can lead to workplace injuries. However, with the right tools at your disposal, you can reduce the risk of injury while improving work efficiencies. This is why construction companies choose Lease Genie when they are searching for the best construction equipment that can be financed at an incredibly affordable price. If you work in the commercial sector, and are required to make frequent deliveries, you may become overwhelmed without the right fleet of vehicles at your disposal. At Lease Genie, we offer professionals in the commercial sector the best selection of commercial vehicles currently available. Streamline your workload capabilities today with equipment financing from Lease Genie! Are you a new business owner that is having difficulty receiving funding? Getting up and running is hard enough, why complicate your endeavors further by not having the proper equipment at your disposal? With Lease Genie, you can furnish your office building with the latest and greatest equipment designed to improve your business’s workflow and reduce operating costs. If you are interested in receiving equipment financing quickly and easily for your business in Omaha, get in contact with the financing professionals today at Lease Genie. We have helped a variety of businesses receive funding in a timely manner, and we’re ready to help you too! Visit our website or call our team of professionals at 402-281-9830 to learn more! This entry was posted in Business Financing Omaha and tagged bad credit leasing, equipment financing, finance lease on March 13, 2018 by David Craig. As an individual that is just beginning to establish a small business, you may find it challenging to furnish your office space with the proper equipment you need to operate continuously without interruption. From office desks and filing cabinets to simple furniture for guests to use while visiting your business, there are a number of expenses that you may not be able to handle on your own. Fortunately with equipment leasing through Lease Genie, it is now easier than ever to get approved for financing so that you can furnish your office’s interior without worrying about exceeding your limited budget. In today’s article, we will be taking a look at why small business financing may be suitable for your company’s needs. If you are a small- or medium-size business that is looking for the right equipment to help you operate efficiently, Lease Genie is here to help address your various needs. We know that no two businesses are alike, which is why we cater to a wide variety of industries for your convenience. 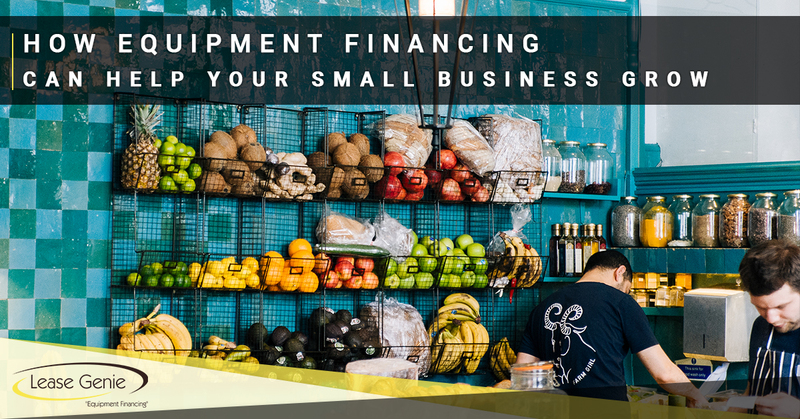 From industrial equipment financing to kitchen equipment leasing, we make it easy for business owners to find the financing options that are suitable for their day-to-day operations. If you would like to learn about how Lease Genie can help your small business grow through equipment financing, consider reading more below. When opening a new business that is continuing to grow, some of your employees my find it difficult to perform at their best if they do not have the proper equipment to perform daily tasks. For this reason, some of your employees will be limited in their daily operations given that they only have a limited amount of resources at their disposal. For this reason, Lease Genie is here to help you receive the financing you need so that all of your employees can perform at their full potential. The first few years of starting up a new business are often the most difficult times for many business owners. In fact, within five years of officially opening for business, more than half of small business owners fail and are ultimately forced to dissolve their companies. While this can certainly be attributed to mismanaged day-to-day operations, many small business owners simply do not have the proper tools at their disposal to help them get their business up and running. For this reason, Lease Genie has helped small businesses grow and succeed for more than 10 years. Our simple process for receiving financing has allowed us to work with small business owners around the country so that they can continue to operate their company without having to worry about a lack of startup capital. Visit our website today to learn how we can help your small business grow! If you find that it is difficult to create relationships with vendors that offer the highest quality equipment for your business, you’re in luck. In fact, Lease Genie’s long-standing reputation within the financing industry has allowed us to offer the top vendors to our customers at a price that they love. With financing options ranging from $500 to more than $100,000, we know that you will be able to receive the funding that you require to get your business up and running with ease, and we urge all business owners that are interested in our equipment financing to visit our vendors page today. Are you a small business owner looking to build your startup capital with ease? Instead of limiting your day-to-day operations, consider contacting Lease Genie today to learn more about how we can help your business grow with equipment financing. We work with a wide variety of companies and offer a number of financing options to choose from such as commercial vehicle financing and restaurant equipment financing. If you would like to see if your business qualifies for our equipment financing program, reach out to our friendly representatives today. With more than 30 years of experience in leasing and financing, we are confident that we can help you become approved within a matter of minutes. Get funded now by visiting our website or calling us today at 402-281-9830! This entry was posted in Business Financing Omaha and tagged bad credit leasing, finance lease, operating lease on February 9, 2018 by David Craig. Whether you are a small construction company interested in leasing heavy machinery for your business, or a new restaurant that is in need of quality kitchen appliances that won’t let you down, there is a good chance that you will need to apply for some type of financing to help your business get its feet off the ground. Fortunately, when working with Lease Genie, it has never been easier for your business to apply for financing. During today’s article, we will be discussing the process of applying for a lease so that you can easily receive funding from one of our professional team members. At Lease Genie, we have helped small and medium businesses grow for more than 10 years, and we continue to do so today. Our financing professionals are veterans in the equipment financing industry and they possess more than three decades of applicable experience to help you receive funding with ease. So whether you have bad credit or simply don’t want to go through the hassle of being funded by a bank, Lease Genie is here to help. If you are interested in learning about how easy our application process truly is, continue reading more on the topic below. 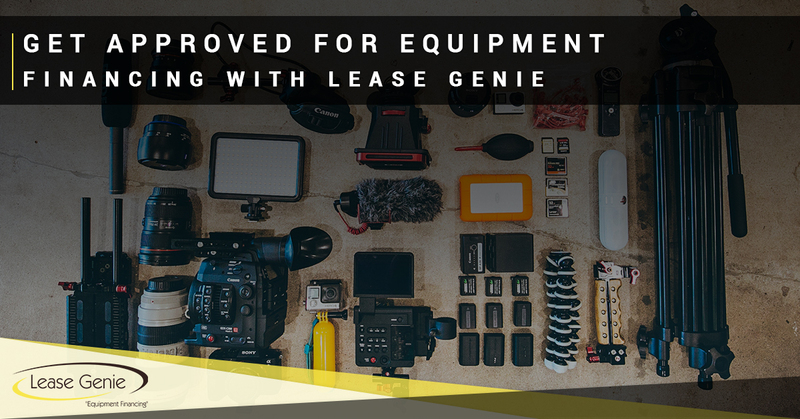 Applying for an equipment lease can sound daunting, but with the help of financing veterans at Lease Genie, it doesn’t have to be. When you begin applying for financing for your business, you will work directly with one of our financing professionals that will help you find the equipment you need to help your company grow. During this time, we will evaluate your credit history to determine if you are a good fit for receiving financing for your business. Once you have determined the equipment that is most suitable for your company’s needs, you will then be required to submit a financial package that will be carefully reviewed by a lender. After gathering the financial records necessary for review, your information will be sent to several lenders so that we may ensure that you receive the best rates and terms from multiple lending competitors. 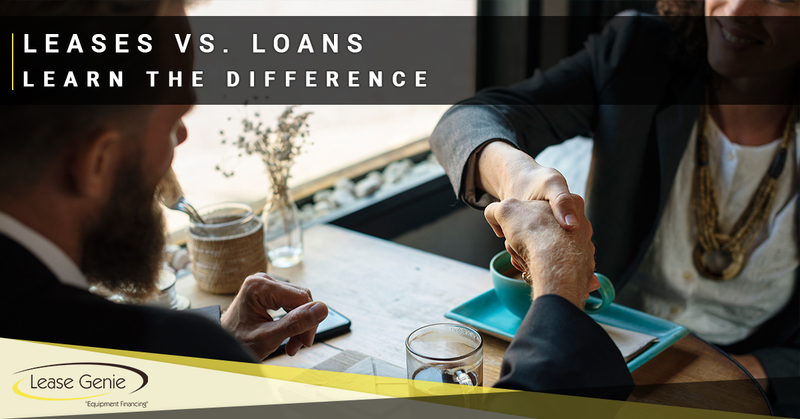 We know that it can be difficult to find a lending company that has your best interests in mind, which is why we work hard to connect you with several of the top lending companies in your area. During this time, you will be presented with a number of financing options that are free of hidden fees and obligations so that you can choose your lender without having to worry about additional strings attached. Once we have determined that you are a good fit for receiving funding, you will be able to receive full funding within 24 hours of signing your funding paperwork. We know that time is of the essence when building a new business, which is why almost all of our applicants can receive funding the same day that they receive their lending documentation. If, for some reason, you are unsure about some of the paperwork that you are signing, our in-house legal team is more than happy to help you with any difficulties that you may be experiencing. This is just one of the ways that we are able to provide you with the most value possible. After you have received funding for your new business, you will be able to keep in contact with our team of professionals that can help you with services ranging from refinancing to reapplying for a new equipment lease. We know that you are looking for the best that there is to offer when it comes to financing your business, which is why Lease Genie always strives to offer our customers unmatched service and attention to detail. At Lease Genie, we are always available to answer any questions or concerns that you may have about receiving startup capital in as little time as possible. We work with both small and medium businesses daily, and have helped countless companies receive funding for their company needs. If you would like to learn more about our full offering of services, or would simply like to begin applying for your equipment financing, reach out to our team of professionals today. We look forward to hearing from you! This entry was posted in Business Financing Omaha and tagged bad credit leasing, finance lease, operating lease on February 2, 2018 by David Craig. If you are planning on starting a small- or medium-sized business and are lacking the funding to properly operate your business without any hangups, you could benefit significantly from equipment leasing through a professional lender. If you are not familiar with leases and what they entail, you may think that leases are similar to loans. However, this couldn’t be further from the truth. In fact, there are many differences between leases and loans, which we will speak more in depth about today. Receiving funding for new businesses can sometimes be difficult, especially if you don’t possess the credit required to be approved for your financing. We understand that you may be hesitant about applying for an equipment lease, which is why we work with all of our customers directly and help our clients receive funding in less than 24 hours after being approved. If you are interested in applying for an equipment lease, but would first like to learn about how it is different from a loan, continue reading more below. How Are Leases Different from Loans? When applying for an equipment lease, you may be wondering what kind of rates you will have to be mindful of during the duration of your lease. Fortunately, leases do not operate in the same way as loans and will rarely require an adjustable rate to be set in place. Alternatively, when applying for a loan, you will most likely have to agree to floating rates that fluctuate from month to month. Those that are looking for complete financing for their business’s equipment will be relieved to learn that leasing is drastically different from loans. Many times, when applying for a loan, you will be required to have a down payment that is equal to a portion of the item’s total value. However, when leasing equipment for your business, you can finance up to 100-percent of the item’s total value. This is especially helpful for small business owners that have limited capital to allocate towards equipment costs. One of the biggest differences between leases and loans is the time it takes to receive funding after filing your application and getting approved for financing. Typically, it is not uncommon for loans to take weeks before they are approved. With leases, however, you are able to receive full funding in less than 24 hours after your application is approved. For this reason, leasing is a great way for small business owners to receive the funding they need without having to wait for weeks to become approved. These are just a few of the reasons why leasing is typically more suitable for small business owners that are looking to get funded quickly. If you would like to learn how you can receive funding for your business, or would like to view every industry that we serve, simply visit our website today and click the “Apply” button! To speak with one of our friendly team members today about submitting your equipment lease application with Lease Genie, simply call 402-281-9830 to get started. This entry was posted in Business Financing Omaha and tagged bad credit leasing, finance lease, operating lease on January 30, 2018 by David Craig.